Earlier today, Ottawa City Council officially adopted the Ottawa Music Strategy, a three-year roadmap to strengthen Ottawa’s music industry and establish Ottawa as a global music city. On April 3, 2018, Ottawa’s Finance and Economic Development Committee approved the three-year strategy, which was then brought to Council for consideration this morning. Developed in partnership with the Ottawa Music Industry Coalition (OMIC), the Ottawa Music Strategy would make more City-owned spaces available for music, promote safer spaces for music and integrate music in strategies for economic development and tourism. The Ottawa Music Strategy was first announced by Ottawa Mayor Jim Watson in March 2017, leading up to Ottawa’s role as the host city for the 2017 JUNO Awards. Following this announcement, OMIC assembled a group of music industry representatives and local business and community leaders, known as the Ottawa Music Strategy Task Force. 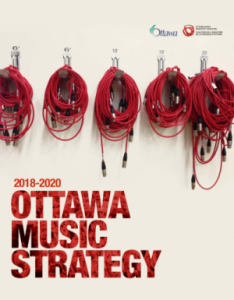 The 15-member group was asked to envision what Ottawa might look like in 2030 following the implementation of a successful music strategy, and to develop a series of practical recommendations that can be implemented. In November 2017, the City’s Draft Budget 2018 committed $100,000 to support the Ottawa Music Strategy, which the Task Force, subject to approvals by City Council through its annual budget processes, hopes to see matched through 2020 with Phase 2 of the Strategy’s recommendations. The full Ottawa Music Strategy can be viewed on the OMIC website.